This is something I have been waiting desperately for! 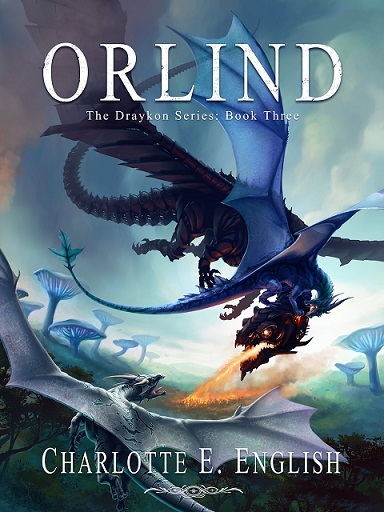 When I first received the ARC of Orlind, I wanted to know what the cover was going to look like. Each book in Charlotte’s series has had remarkably wonderful, eye-catching covers. The art work is simply mesmerizing on each of them. When I heard that the cover would not be ready for quite some time, I was hugely disappointed. I kept pestering Charlotte for updates which she did not really have. Well, the wait is finally over! Today, I get to reveal the fantastic cover for the third and final book in the Draykon Series! Today is a very special day, as I get to interview one of my favorite indie authors! Charlotte E. English is the author of the Draykon series. I have given each book in the series a 5 star rating, so you can imagine how much I like them. I have one more treat for you. As part of the ‘Featured Author Week’, Charlotte is also appearing on two other blogs, where you can take a look at two amazing character interviews! Now, I can’t wait any longer, so lets get started! The Draykon Series is high fantasy, set in a rather whimsical alternate world. It also has a strong mystery element. Ritesh: You can find a much longer description of the series here! I hardly know! It can be difficult to figure out precisely where an idea came from. I’m sure that my love of books like Alice in Wonderland had something to do with it, though; I’ve always been fascinated by really original (and whimsical) world-building, and that’s where Draykon really started – with an idea for a weird and wonderful world.